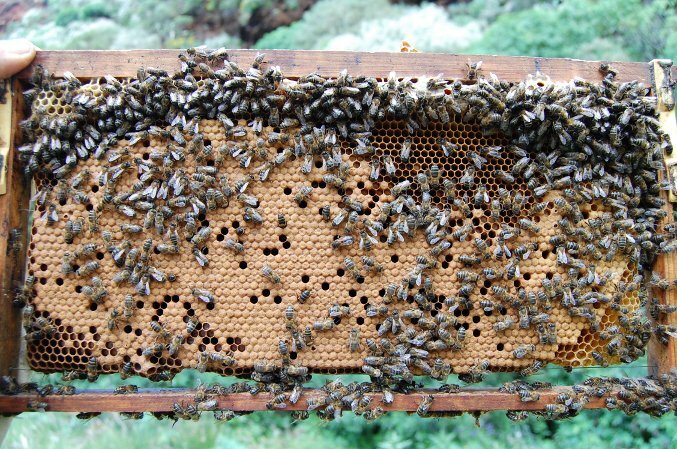 Just now some of the beekeepers on the Spanish mainland are starting with small-cell bees. Spain hosts few beekeepers compared to Germany, but the average individual has more colonies. Many professional beekeepers whose lives depend on their bees work here. 1000-3000 colonies are quite usual. Our problem is; we live of the bees and therefore our profession must work. But the weather alone is already a very big risk factor with the climate change giving the Spanish beekeepers a hard time. The catastrophic health of bees is a further issue. If we now switch to the system of small-cell bees, we face one more risk. The advantage is Dee Lusby and other beekeepers who have been working with small cells have done much of the pioneering research and we can use it as a base for our work. One big problem I see is that the beekeeper will at first have to adapt to the new situation. Working according to De Lusby’ system with bees, no longer has much in common with today's conventional beekeeping. Our first principle is that we DO NOT treat. The beekeepers must learn to recognize signs of crisis in the hive at the very first stage above all and also have to learn to respond properly. This is purely a matter of experience and can be learned within a few years., We can’t recommend these professional beekeepers to jump right into the cold water and switch immediately with a large part of their hives. It is necessary at first to start with 10 or 20 colonies, on order to accustom them to small combs and later subdivide from them. Thus, we can quickly multiply the number of small cell colonies and observe closely how the bees act in the new situation, train our reactions in crisis situations, learn how fast the genetics improve colonies through selective breeding with the most responsive hives and soon handle a larger number of colonies without treatment. This is not invented, it is based on experience. In the event of problems we can always rely on our colleagues who may have more experience. With Dee, I always got a reply within hours in response to my questions and I will be handling all inquires in the same manner.